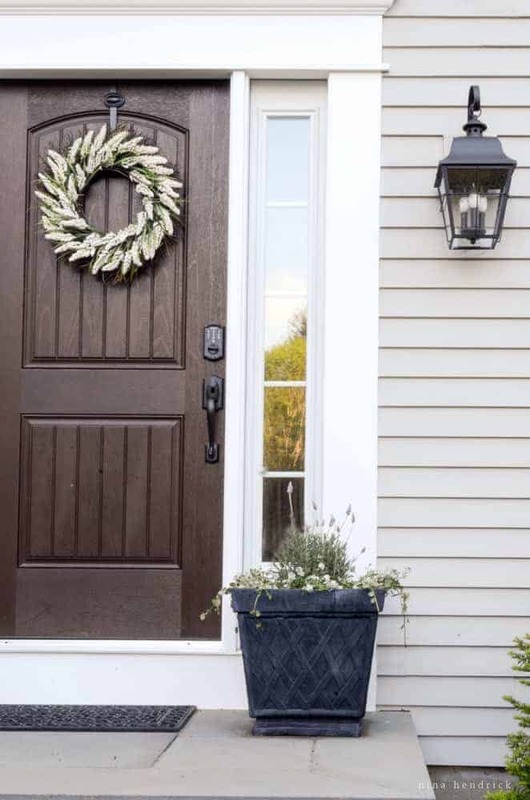 7 Elements of New England Style | Read how the elements of the different regions of New England influence decor and architecture in a Massachusetts home. For a long time, I had difficulty when it came to categorizing my style. As I often say, I don’t actually believe that most people fit into one neat little category in any part of life, and decor style is no exception. I would go bananas if I boxed myself into something like “farmhouse” without leaving the door open to other styles. My decor has always been a blend, and I don’t forsee that changing anytime soon! 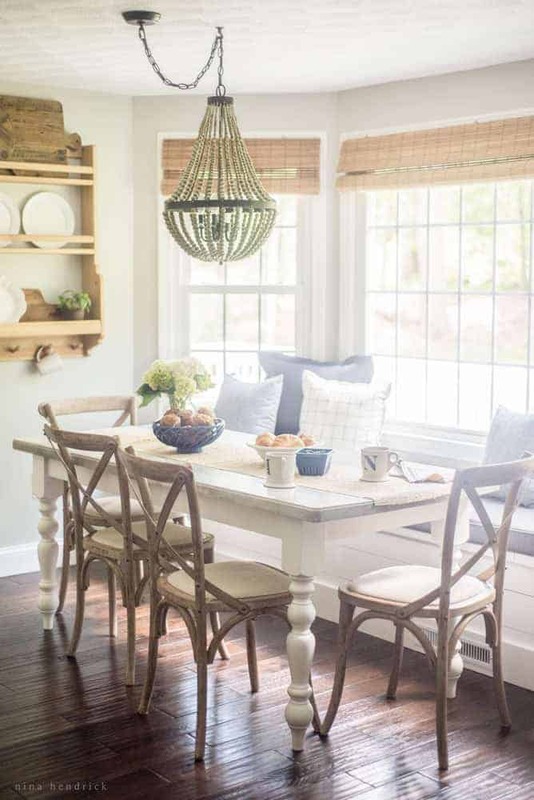 I love Farmhouse style, but I also love Coastal style, and Cottage. Sometimes I even bring in hints of primitive, traditional, and rustic style. It took me way too long to realize what perhaps should have been obvious from the beginning: I have New England style. I’m inspired by this region that I was born in and I am head over heels in love with the architecture of. Every single element of my design style can be traced back to the things I love about living here. I am and always have been inspired by the weather-beaten coast, with its proud lighthouses and salty cedar shingles. 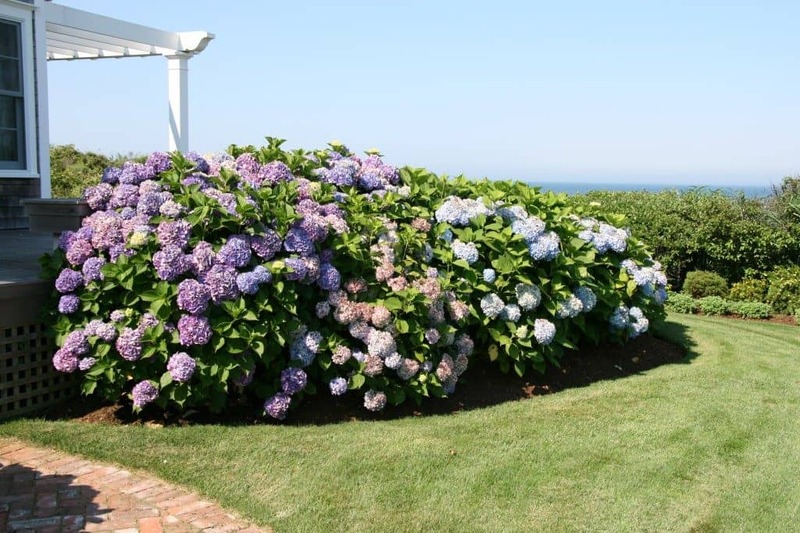 When it comes to yard choices, Nantucket is my ultimate inspiration with its Adirondack chairs, abundant gardens, and most of all- hydrangeas the size of dinner plates. Ogunquit, Maine calls to me with its rocky coastline, crystal blue water, stunning homes, and quaint little Perkin’s Cove. Whenever I pull blue into my home- both navy and lighter shades, those are the places I’m imagining. 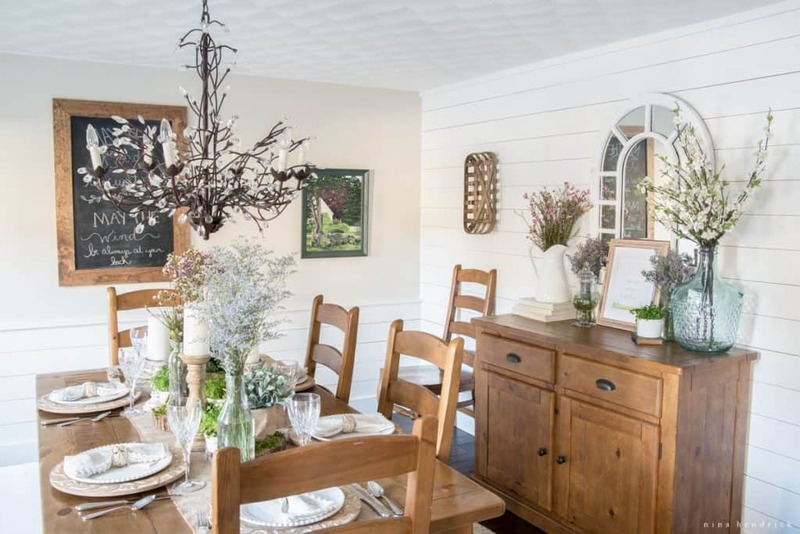 I know “farmhouse” is a buzzy style right now, and it means something different in New England than perhaps it does in other parts of the country. As much as I love the idea of acreage, farmers here usually didn’t have large plots of land as far as the eye could see. They had tidy yards and lived somewhat close together out of solidarity in a new and wild land. They fought and struggled to get things to grow in the rocky soil, and what they grew was to feed their family and hopefully even to share with their parish in an abundant year. I will admit, sometimes I play the comparison game and I wish for a big airy farmhouse with tall ceilings and sprawling porches on a big piece of land. 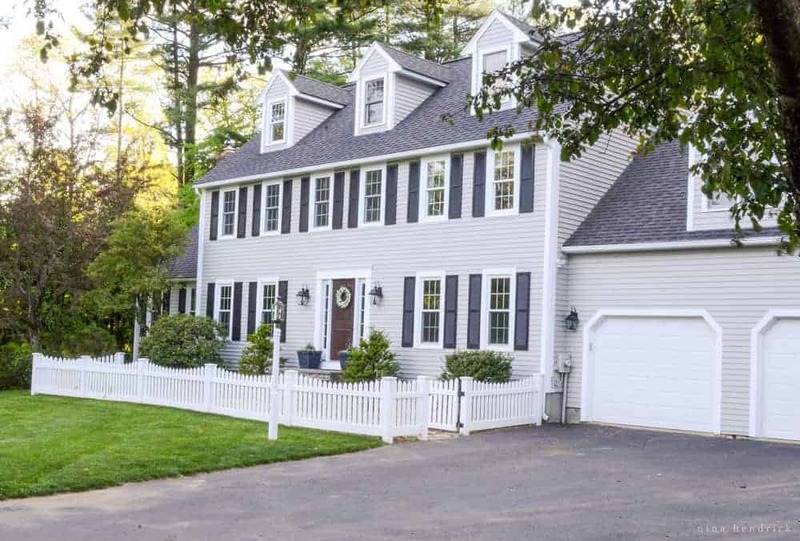 However, our Massachusetts colonial with its low ceilings and neighborhood is actually much more accurate to 1800s “New England Farmhouse” style. In fact, part of our neighborhood (which was a huge selling point for me) includes historic farmhouses with beautiful barns that seamlessly give way to the new homes. Those old farmhouses are the homes I draw inspiration from when it comes to the atmosphere of our outdoor space. Having a farmer’s porch and a backyard garden (and even backyard chickens- maybe someday) is very similar to how my ancestors would have lived, and having a stone wall in our backyard made it feel just like home. 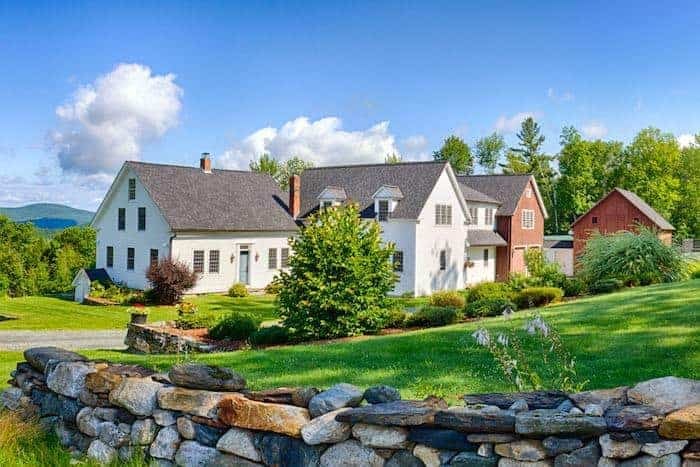 Speaking of ancestors, I would be remiss to talk about New England Farmhouses without talking about my home state of New Hampshire. Both sides of my family had beautiful homes of historic farmhouses filled with antiques, big barns, and stone walls that were my playscapes as a child. Nothing has influenced my style quite as much as those homes. 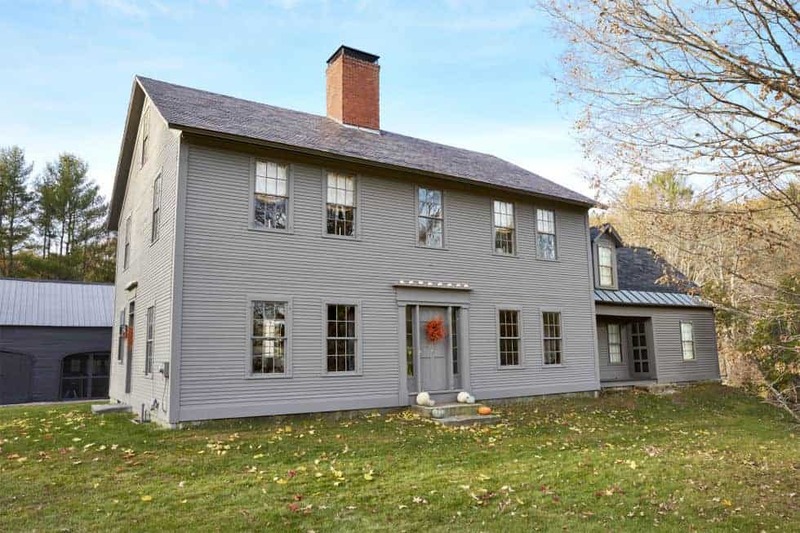 Primitive style is kind of the precursor to New England Farmhouse Style. It’s based more on the communities and villages of the 1600s Puritans. I’m obviously biased, but my parents home (my childhood home) is a nice blend of New England Farmhouse and Rustic/Primitive style. It is a reproduction antique saltbox colonial with beautiful wood beams and tongue-and-groove ceilings. 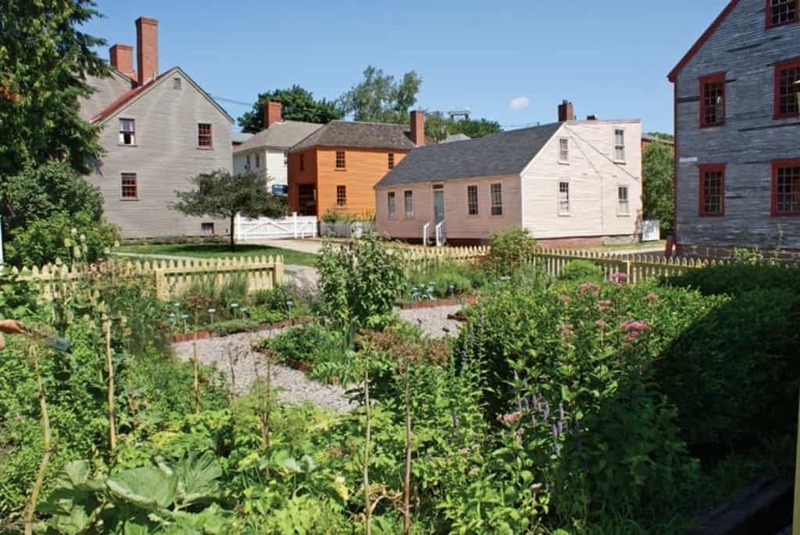 It brings to mind the oldest homes in this country, the 1600s Puritan homesteads in Plymouth, Salem, and Strawberry Banke. When you see me bring in raw wood and antiques, it’s often influenced by my parents’ decor. However, I went the other direction with my love of painting tongue-and-groove white (my dad cringes when I paint things white), so I didn’t adopt the style outright. However, I do appreciate it and I love to dream up ways to decorate in their home. 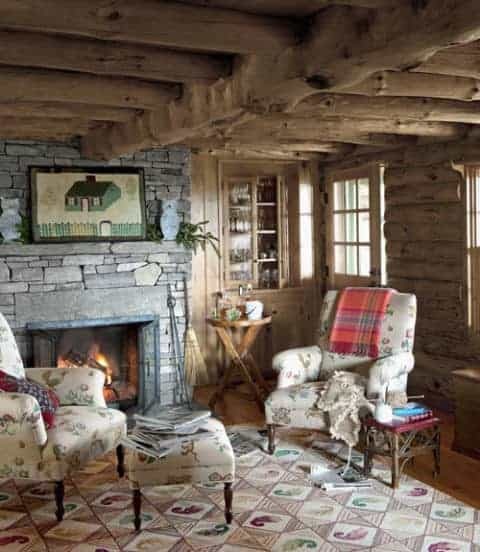 Rustic log cabin style is another common New England staple. Personally, I think it can be overwhelming in large quantities (like the interior of Camp), so I think it’s best to have a few of these focal points in a room without necessarily having a whole room that is floor to ceiling wood with wood furniture. Mack is most drawn to rustic log cabin style because of Camp. I can’t pretend it’s my favorite, but it is important to include in our home because it’s the only thing he really somewhat gives an opinion on. For this style, think hunting lodge. Lots of wood, plaid, fur, leather- you get the idea. In our Massachusetts home, this translates to things like our wood mantle and pine dining room furniture, which were wood pieces in otherwise light rooms. In our decor, I bring in things for Mack like a dark fur throw, wooden signs, etc. Small doses. At Camp, I haven’t done much yet. I intend to try to preserve the log cabin character but lighten things up with softer fabrics and white furniture. We’re going the other direction- breaking up an incredible amount of rustic orange-toned wood. One element of rustic style I can get on board with is the coziness, especially in the winter. There’s nothing I love more than a warm knit blanket and a fire! wildlife motif- deer, bears, fish, etc. 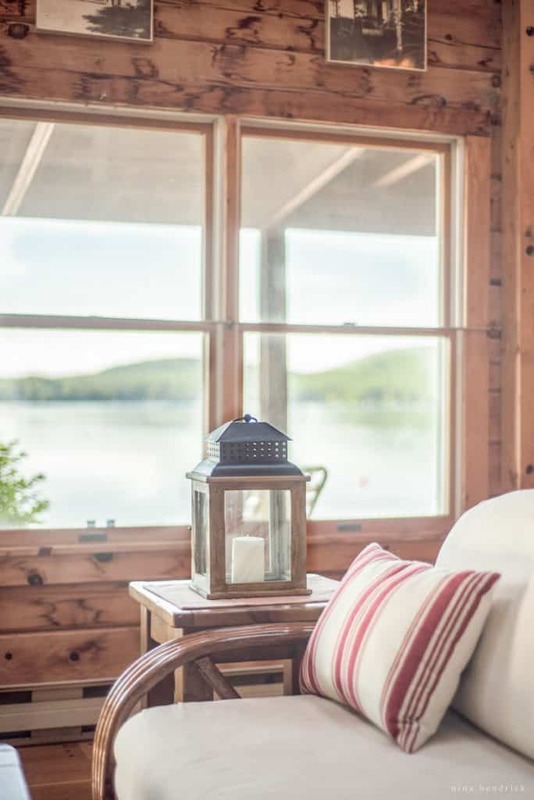 While the Maine coast inspires me, the Lakes Region of New Hampshire is my true heart and home and the decorating style I most closely identify with. 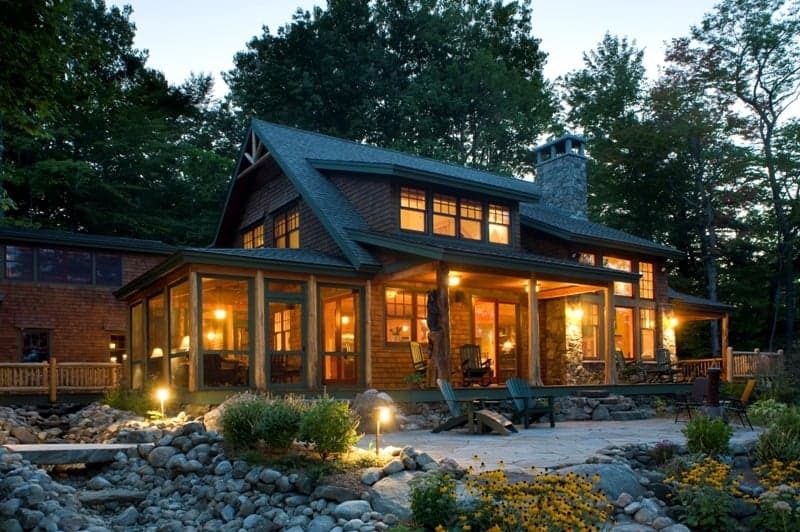 New England Lake Cottage style is a blend of the four styles I mentioned above. Like all of the styles, its inclusion in my home was once again influenced by family, from my part, my grandparents’ A-frame lake cottage, which we simply call “The Cottage”. Mack, of course, has the hundred-year family history of “Camp” and the dwellings that were there prior to the 1980s log cabin. 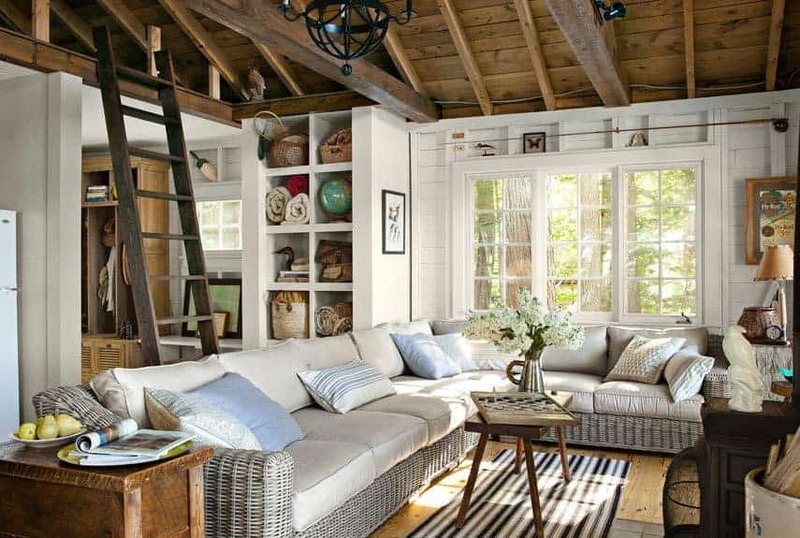 Camps and cottages are an important component to New England style. Unfortunately, they are somewhat a fading component, as the trend seems to be to tear them down in favor of larger Cape Cod style homes. I get it. They were generally built cheaply and quickly and were not winterized. However, I adore updated cottages with their exposed walls painted a crisp white. When you see planking and board-and-batten in our home, that is what it is influenced by, as well as any light and bright colors. This was hard to define. However, I wanted to make sure to mention that I appreciate the historic elements of New England coastal cities. 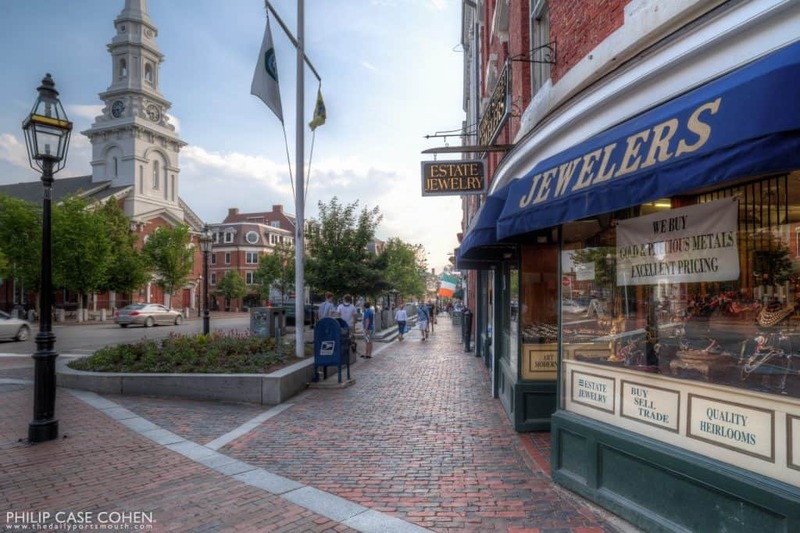 Portsmouth, NH is one of my favorite places to visit (and eat! Oh my gosh, the restaurants!). It blends the new and old so beautifully. While I prefer Portsmouth, I love the historic elements of Boston and the Old Port in Portland, Maine, as well. When I bring in dark metal finishes and lanterns, those places are what I’m picturing. My plans for a brick patio are influenced by Market Square in Portsmouth. Similar to rustic style, traditional style isn’t necessarily at the top of my list, but the influence is there. I feel like I could have pushed in that direction with this house and decor when we moved in, but I also think it would have felt forced and inauthentic to our family’s personality. 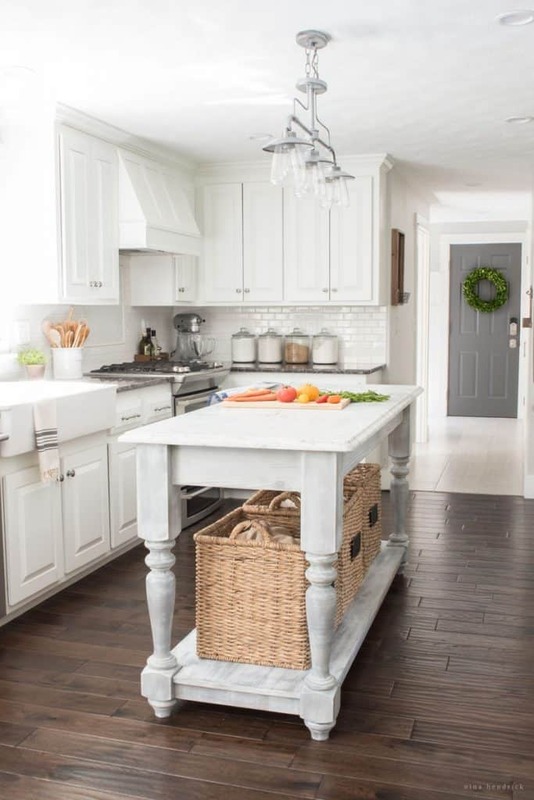 With that being said, the dark wood floors, white trim, white cabinets, and white built-ins throughout our home are a nod to traditional New England style. Really, if you removed the accessories and furniture, the base in a lot of the rooms in our home is pretty traditional. All in all, I love the area I’m from, and I’m so proud to be a New Englander. I love that it has played so heavily into my decor style developing into what it is. Do you love New England style? What’s your favorite element? Thank you for the tips. I really love the style and I’m thinking of incorporating it into my home decor. Love it! I am so excited to find your blog. I love,love New England. I am visiting Portsmouth this fall. Visited New England and Cape Cod a few years ago and still long to return, such a beautiful part of the country. Thanks for the great post, brings back all I loved while we were there! Hello, this is a beautiful blog! I found it as we are looking for a new color to paint the exterior of our home. I live in New Jersey, but love New England, especially the fresh, coastal style from that area. Our home is currently somewhere between light-medium gray with white trim and an espresso-colored wood door. Our neighbors, who have always loved our home and have copied many elements from our porch to our landscaping, just painted their home the same color as ours! While it’s flattering (not really! ), we feel it’s time to change our exterior as it has not been painted since we moved in 8 years ago and maybe for a few years prior to that. We are thinking about a not-so-boring neutral like taupe. What do you think? My goal is to bring some New England to New Jersey! I also plan to replace our boxwood bushes with hydrangeas. I enjoyed your insight into design styles. I am moving back to my home state of Delaware and need to decide what I should keep. Do you think queen anne furniture will ever come back or should I just let it go? At the age of 65 I need less furniture to up keep but still need good quality. I used to enjoy antiques too but find they were pieces to look at and they offered little comfort. I would appreciate your thoughts. I love this! I’ve found so many beautiful decor ideas on Pinterest etc. but not much that I feel like I can connect to. I’m fairly new to owning a home, new to decorating, and new to this page and this post makes so much sense to me. I was born and raised in Massachusetts and live in an 100+ year old farmhouse about 30 min outside of Boston. It’s definitely not a rural community but my home has many of the New England Farmhouse charactistics that you mentioned including close neighbors and what’s left of an old stonewall in the backyard. I’ve had such a hard time figuring out how to decorate, and even what paint colors to choose because I’ve had a hard time figuring out my style. 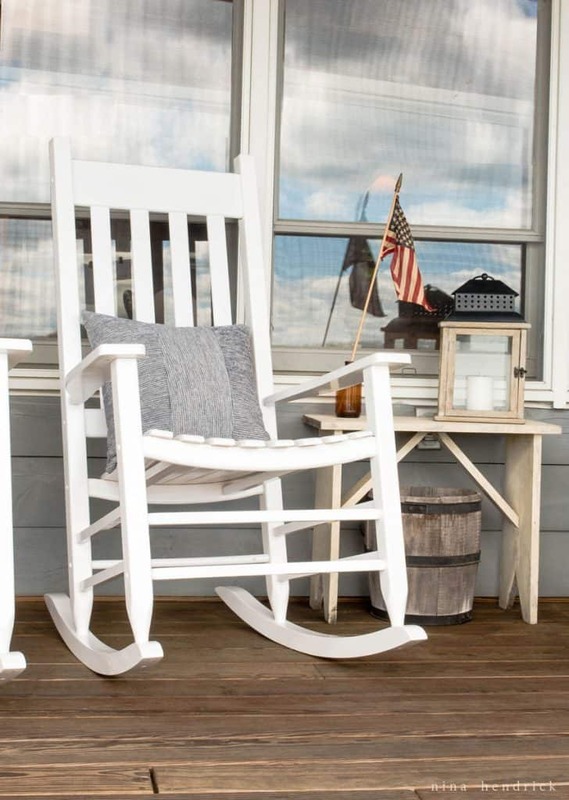 When I think of “New England style” it sounds stuffy to me and makes me think of black painted rocking chairs and cranberries, but so many other ideas feel inauthentic. This is so helpful!